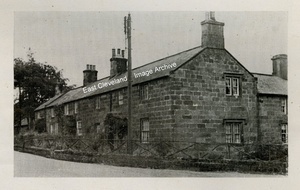 Morehead Terrace, Easington (across the Grinkle Lane/Whitby Road junction); this time, consisting of three cottages. Corner Cottage, sold for £460 and wow it had electric light. The next cottage also had electric light, but water was still obtained from the fountain across the road. The last on the terrace (no 1 Morehead Terrace) was the police house; occupied by Constable Clarkson, mains electric lighting but no running water. Thanks go to Mrs Waton for loaning us the catalogue for the disposal sale of the Grinkle Park estate. Morehead Terrace consisted of numbers 1,2 and 3 on Whitby Road and 3a, 4, 5, and 6 on Grinkle Lane.